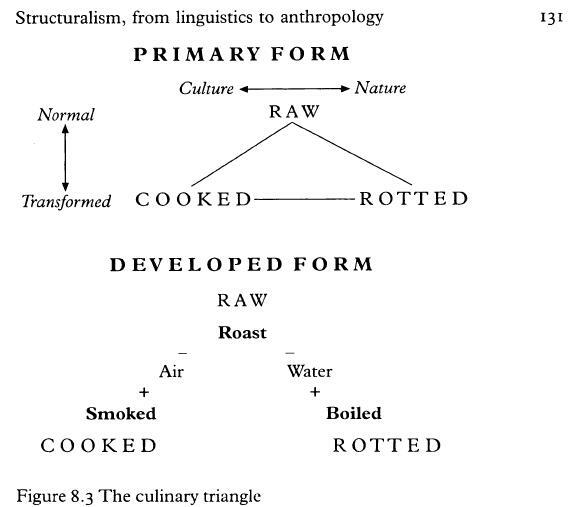 Lèvi-Strauss’s culinary triangle is a short, dense, and influential text. In order to really engage with the text and its ideas, create your own culinary polygon based on your own diets, choices, and implications. These can follow the paradigm of Lèvi-Strauss’s text or you can follow a more creative direction if you feel so inspired. Think about how this line of reasoning could translate into your own world, given the kinds of (food) resources you have available to you. How does this manifest in a diagram like the one developed by Lèvi-Strauss? Articulate your reasoning behind your diagram in a 1-2 page paper. How does your diagram reflect not just your food choices, but also the social, cultural and historical constructs that shape your diet?